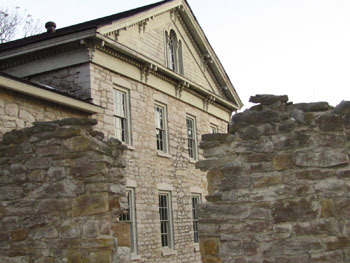 The James Eldred home in Eldred, IL is a location rich with history and sadly tragedy as well. Just google the name Eldred and you will find a long family history of important figures throughout England and America. After some of the Eldred family settled Illinois, they established a fine farming and cheese business. It was James J Eldred that built this grand home for his growing family. However darker days were ahead as the family suffered the loss of all three of their daughters, along with the down fall of their family business. Mr. Eldred remained in the home until his own death and the house was never used as a permanent residences to another family. Leaving me to think the Eldred’s never really left. The house is beautiful, even in its dilapidated state, with great big stone walls and large windows. The inside is huge and you can tell it was grand for a home of its time. However, there were wall and ceiling pieces that had fallen everywhere, with floor boards missing in some spots. The strain to maintain the property over the years was obvious. After a short history lesson from the host, we started moving through the whole house among the other guest. We snapped photos and swept the house for EMF readings. From time to time we would hear singing like from a young girl. We heard it on the front porch where no one else was or in the dining room on the first floor where we received interference on our audio at the same time. It sounded so loud and real that we would ask each other if it was one of us. If there were spirits about they seemed sweet and playful, or at least that’s how the night started out. Suddenly as we entered the men’s parlor just across from where we had heard the singing, Wendy was overwhelmed with a horrible pain in her stomach. We stayed in the room, still attempting to contact any spirits, thinking the pain in Wendy’s stomach wasn’t related to anything with the house. It was after we left the room and Wendy said she felt completely better and also never had pain again that night that we thought it could have been something paranormal. The men’s parlor once was the resting place for a traveling salesman that came to the Eldred home but was very ill so the Eldred’s took him in until his passing. After that we explored the basement. The “cheese room” is said to be a popular spot, however it’s the room across from there that gave us the biggest excitement. We set up a video camera on a tripod and moved around the room taking photos. When Wendy went to get the video camera the tripod completely fell over smashing the camera and the attached lights to the ground. As Wendy pieced the attaches of the camera back together, she stood up and heard a voice behind her. It was a present that did not seem kind. This scared her enough to push pass Chris and stand by the basement stairs where light from outside was coming in. After recovering from that surprise. We visited the “cheese room” where Chris saw a shadow moving across the wall. As other guest came into the basement, we moved out. As we were standing outside snapping photos, Chris saw a shadow in the attic space. We were under the impression that no one was allowed in the attic, so we quickly ran up to the attic to see if you could in fact get up there and if anyone was there. While the attic can be accessed, no one was in the attic by the time we got there, and after a short time of us being up there we were discovered by the evening’s host and asked to leave that area as it wasn’t structurally safe. We spent the rest of our evening into morning again moving through the house. We had no more extreme experiences, but with what we have collected in evidences and the experiences of earlier in the night definitely showed us the paranormal energy that the James Eldred House has, this may go down as one of our favorite places.